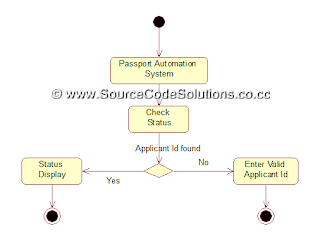 To Analyze the Problems, Gather the SRS(Software Requirements Specification) and Model the UML or OOAD diagrams for "Passport Automation System" using Rational Rose Software in CS1403 - CASE Tools Laboratory. the system, the information is in turn forwarded to the regional administrator's (Ministry of External Affairs) office. The application is then processed manually based on the report given by the system, and any forfeiting identified can make the applicant liable to penalty as per the law. The system also provides the applicant the list of available dates for appointment to 'document verification' in the administrator's office, from which they can select one. The system forwards the necessary details to the police for its separate verification whose report is then presented to the administrator. The administrator will be provided with an option to display the current status of application to the applicant, which they can view in their online interface. After all the necessary criteria has been met, the original information is added to the database and the passport is sent to the applicant. 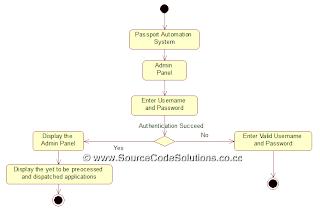 Passport Automation System is an interface between the Applicant and the Authority responsible for the Issue of Passport. It aims at improving the efficiency in the Issue of Passport and reduce the complexities involved in it to the maximum possible extent. If the entire process of 'Issue of Passport' is done in a manual manner then it would take several months for the passport to reach the applicant. Considering the fact that the number of applicants for passport is increasing every year, an Automated System becomes essential to meet the demand. So this system uses several programming and database techniques to elucidate the work involved in this process. As this is a matter of National Security, the system has been carefully verified and validated in order to satisfy it. • The System provides an online interface to the user where they can fill in their personal details and submit the necessary documents (may be by scanning). • The authority concerned with the issue of passport can use this system to reduce his workload and process the application in a speedy manner. • Provide a communication platform between the applicant and the administrator. • Transfer of data between the Passport Issuing Authority and the Local Police for verification of applicant's information. • Users/Applicants will come to know their status of application and the date in which they must subject themselves for manual document verification. • Administrator - Refers to the super user who is the Central Authority who has been vested with the privilege to manage the entire system. It can be any higher official in the Regional Passport Office of Ministry of External Affairs. • Applicant - One who wishes to obtain the Passport. 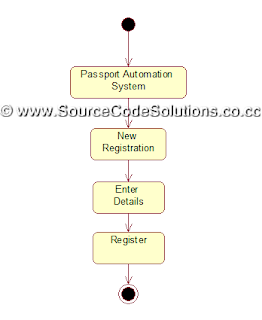 • PAS - Refers to this Passport Automation System. • HTML - Markup Language used for creating web pages. • J2EE – Java 2 Enterprise Edition is a programming platform and it is the partof the java platform for developing and running distributed java applications. • HTTP - Hyper Text Transfer Protocol. • TCP/IP – Transmission Control Protocol/Internet Protocol is the communication protocol used to connect hosts on the Internet. IEEE Software Requirement Specification format. 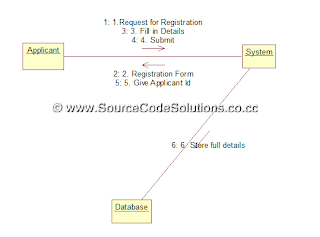 SRS includes two sections overall description and specific requirements - Overall description will describe major role of the system components and inter-connections. Specific requirements will describe roles & functions of the actors. The PAS acts as an interface between the 'applicant' and the 'administrator'. This system tries to make the interface as simple as possible and at the same time not risking the security of data stored in.This minimizes the time duration in which the user receives the passport. • Front End Client - The applicant and Administrator online interface is built using JSP and HTML. The Administrators's local interface is built using Java. • Web Server - Glassfish application server(Oracle Corporation). • Back End - Oracle database. The server is directly connected to the client systems. The client systems have access to the database in the server. • Secure Registration of information by the Applicants. • Schedule the applicants an appointment for manual verification of original documents. 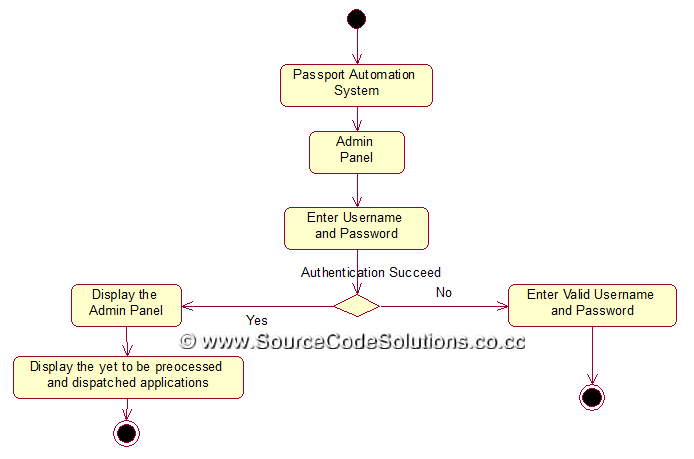 • Panel for Passport Application Status Display by the Administrator. • SMS and Mail updates to the applicants by the administrator. • Administrator can generate reports from the information and is the only authorized personnel to add the eligible application information to the database. • Applicant - They are the people who desires to obtain the passport and submit the information to the database. the documents and give suggestion whether or not to approve the dispatch of passport. • Police - He is the person who upon receiving intimation from the PAS, perform a personal verification of the applicant and see if he has any criminal case against him before or at present. He has been vetoed with the power to decline an application by suggesting it to the Administrator if he finds any discrepancy with the applicant. He communicates via this PAS. • The applicants require a computer to submit their information. • Although the security is given high importance, there is always a chance of intrusion in the web world which requires constant monitoring. • The user has to be careful while submitting the information. Much care is required. Providing a high-level view of what the system does. Identifying the users ("actors") of the system. Determining areas needing human-computer interfaces. • The Applicants and Administrator must have basic knowledge of computers and English Language. • The applicants may be required to scan the documents and send. 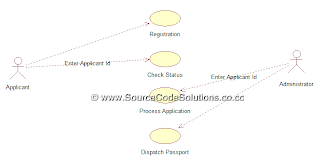 The UML provides the use case diagram notation to illustrates the name of the use case actors and relationship between them. 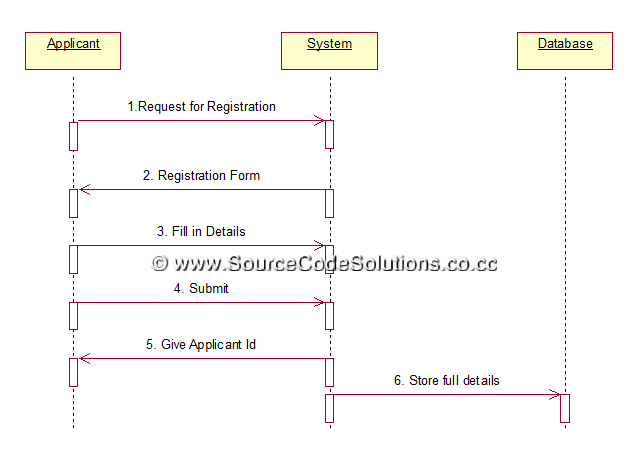 A sequence diagram illustrates in a kind of format in which each object interact via messages. It is generalization between two or more specification diagram. 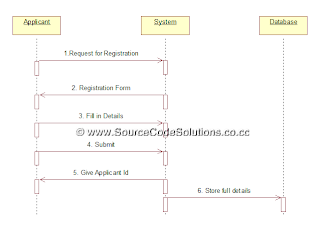 Sequence diagram is an interaction over view diagram. It provides a big picture over view of now a set of interaction is related in terms of logic and process flow. It illustrates that object interaction in a graph or network format in which object can be placed any where on the diagram. 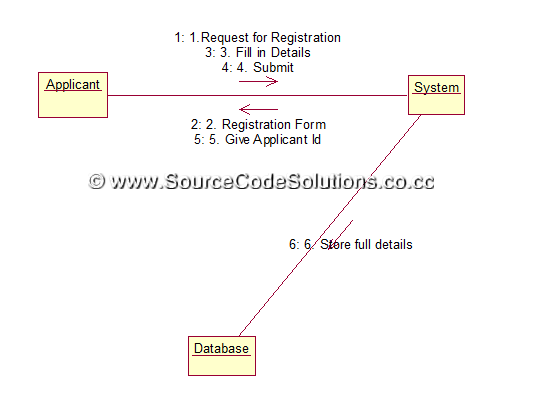 In collaboration diagram the relationship between applicant, system admin and authority. The people must fill the application form according to detailed furnished. The system admin verifies the all details and forward details to authority. He is enquiry the person and then issue the passport to applicant. 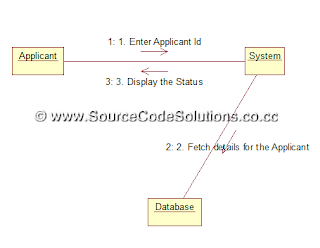 The UML include the class diagram, to illustrate and their association. They are used for static object modeling. It illustrates the intrusting events and state of an object and behaviors of an object is reaction to an event. Transaction shows as allows labeled with theirs event. It is included with initial pseudo state and final end state. 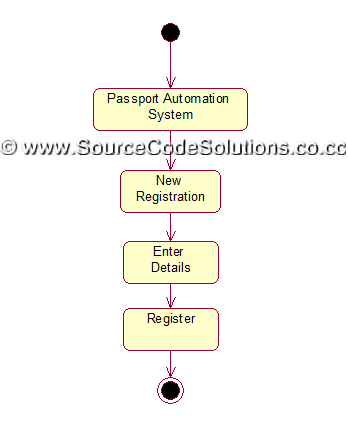 The state chart diagram of passport automation system that the service of authority, who is issues the passport received by the applicant and getting the passport. 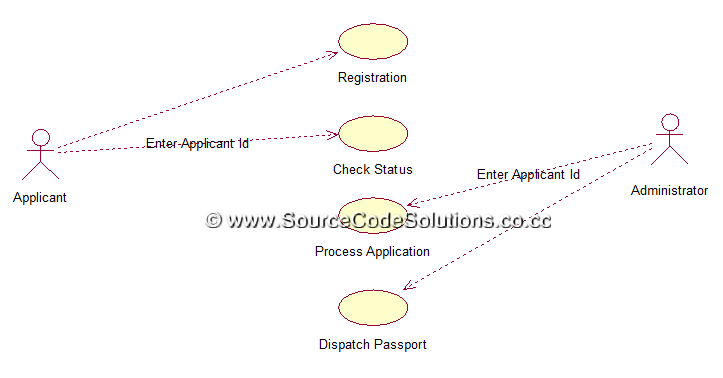 Activity diagram shows sequential and parallel activities in a process. They are useful for modeling business, workflows, the data flows and complex algorithm. A UML activity diagram offers rich notation to flows a sequential of activities. It may be including parallel activities. It may be applied to any purpose, but it is popular for visualization of business workflows and use case. A component represent a modular part of a system, that encapsulates it contents and whose manifestation is replaced with in its environment. A component define its behaviors in terms of provide and required interfaces. 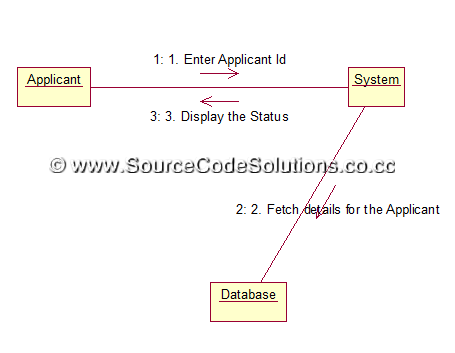 Here the three components are applicant, system admin and authority. The interface between people and system admin, from people to authority. A deployment shows the assignment of concrete artifacts to computational nodes. It shows the deployment of software elements to the physical architecture, and the communication. Deployment diagrams are useful to communicate the physical and deployment architecture. 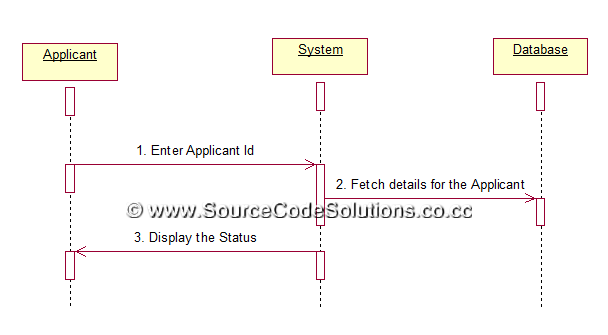 In the deployment diagram the object reference in component diagram is also included the deployment diagram. In this authority and system admin, interface through the people. It is the process of installing the program. 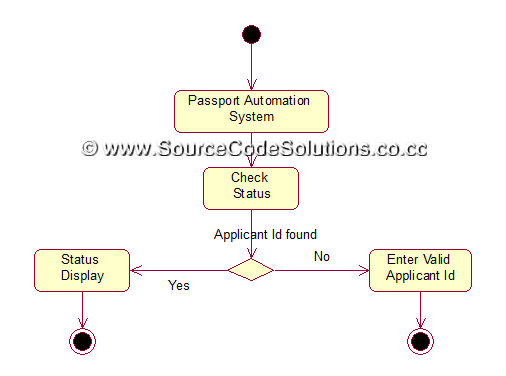 Thus the "Passport Automation System" application was successfully designed and the output was verified using Rational Rose Software in CS1403 - CASE Tools Laboratory..